Each tiny bottle contained barely a few pieces of bird's nest soaked in rock sugar solution. 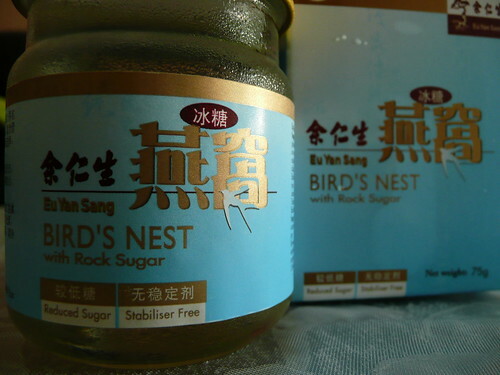 The bird's nest, alike shark's fin, doesn't taste much by itself. Once cooked, the texture strongly resembles that of agar agar, which is slightly harder than jelly. Such delicacy is highly valued by the Chinese due to it's nutritional values, rarity, life endangering job of harvesting the nests from limestone caves and the arduous cleaning process before yielding pure bird's nest.